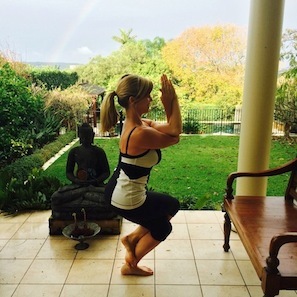 A gloriously detoxifying posture, Garudasana, or Eagle Pose, can be a bit intimidating at first. With a few modifications and some tricks to stay balanced, however, even the newest yogi can feel comfortable giving it a go. Garudasana is great for yogis because it builds strength, increases flexibility, and hones your ability to concentrate. It opens all the major joints in the body: the shoulders, the elbows, the wrists, the hips, the knees, and the ankles. It’s a wonderful pose for the runners out there, as it fills joints up with fresh blood, counteracting miles and miles of pounding on concrete. It also releases a tight IT band, which is a notorious spot for distance runners. Garudasana tones the legs, arms, abs, and improves balance. Bikram says it even helps flush out cellulite, so don’t be surprised to find me cooking dinner, drinking a glass of vino, or watching TV all in Garudasana. A girl can hope, right? 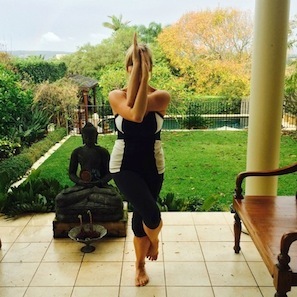 Since it is a twist, Garudasana detoxifies your body. It specifically flushes out your kidneys, circulates blood to your reproductive system, and stimulates the lymphatic system. With all these amazing benefits, it's time to take off! 1. Balance starts in Tadasana. Begin this posture before you even move into it. Find your drishti (focal point) in Tadasana, or Mountain Pose, taking 5 to 7 deep breaths and turning your gaze inward. Commit to an open eye meditation. When you’re ready, bring your awareness to your left leg. Scan it. Feel it ground you down and feel the rebounding support from the earth below. Shift your weight into your grounded, supported, and strong left leg. 2. Start with your wings. Extend your arms out like wings and reach up to the sky above you. Powerfully sweep your right arm under your left. Cross at the elbows and if available, connect the palms. 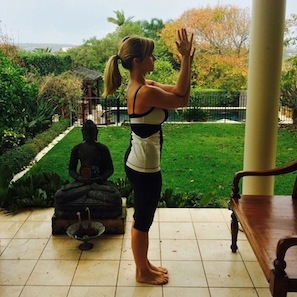 If you are new to this posture, press the back of your hands together. 3. Cross your thigh high. Bend your knees and sit down into Chair. Lift your right leg and cross it as high as possible over your left thigh. The higher you cross the legs, the more balance you’ll find. I find that the tighter I squeeze my legs together, the more stability I have. If you’re new to this posture, press the knife-edge of the right foot into the calf of the standing leg. If you’re feeling open today, wrap your right foot around the back of the left calf. 4. Sit down deep but tall. Square the hips. Sit down deeper using the strength in the legs while the chest stays proud and shoulders stack above the hips. We have a tendency to lean forward and hunch over the knees and toes. Visualize yourself sliding down a wall with your shoulders and upper back flat against it. 5. Balance radiates from your core. Engage Mula and Uddiyana Bandha and bring balance back. The key to balance is finding the proper alignment for your body. Garudasana is a challenging posture and requires a lot of strength, flexibility, and concentration. If you fall out of it, just turn the corners of your mouth up, remove self-judgment, and try again. Sometimes we fly high; other days we're just barely off the ground. Know that wherever you are right now is where you’re meant to be. 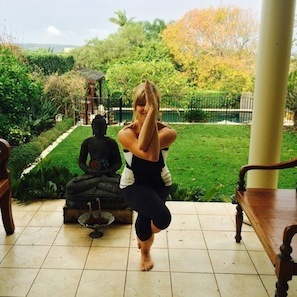 Where are you in your Garudasana?